Successfully Added Illuminated Merry Christmas Sign (Battery Powered + Ready To Hang) to your Shopping Cart. Great for your home, great for your shop, great to hang in the reception area - it's an illuminated Merry Christmas sign for adding instant holiday cheer! No hassles or headaches, it's battery powered and comes with a cord so it's ready to hang. 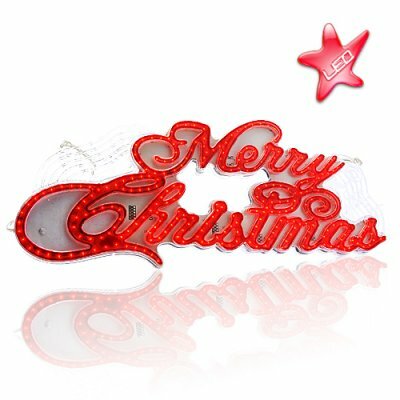 When powered the sign gradually lights up its red LED lights letter by letter to say "Merry Christmas". A simple and way to put some holiday light into your piece of the world. All that is needed are three AA batteries and you can start making the holiday come alive. Available in our warehouse right now, order your stock today and we will express ship it out to you tomorrow! Comes with a cord - hang and go! Can also be placed on a shelf, counter top, etc. Is there a limit on the amount of these I can order? No there is not. However if you plan on ordering 500+ pieces then please contact our customer service team so that we can assure you of getting all of them in a single shipment and at the best price.